If you have ever had an upper respiratory infection and noticed enlarged, tender bumps under your jawline, you have encountered the lymphatic system in a very personal way. Those bumps are lymph nodes, and when they are fighting infection, they can become enlarged and even painful. 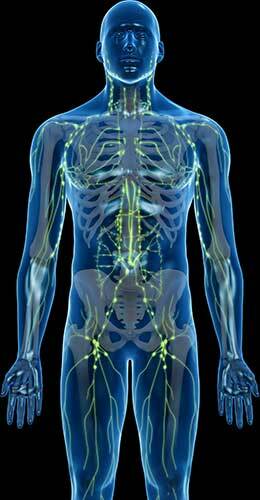 The lymphatic system is a vital part of the immune system. It includes organs such as the thymus and spleen, as well as countless fine vessels that move lymphatic fluid, or lymph, throughout the body and filter it through the lymph nodes. Where there are blood vessels, there are lymphatic vessels. The lymphatic vessels lead to the bloodstream and, from there, to the heart – so it is somewhat poetic that the one-way valves within each lymphatic vessel are heart-shaped. The lymphatic system has three main functions: it drains excess fluid from the tissues into the veins, transports fatty acids from the digestive tract, and helps to protect us from disease by circulating immune cells and trapping pathogens. Fungi, bacteria, and viruses are filtered by the lymph nodes – small (usually no larger than 1” in diameter — but there are about 600 of them!) masses of lymphatic tissue that are dotted along the system of lymphatic vessels. Some nodes are located deep in the body (such as the abdomen and around the heart), while others are closer to the skin (such as those in the face, neck, and underarms). The nodes house white blood cells, which are crucial to our ability to fight off infection; the nodes also trap pathogens and destroy them. In case of infection, the lymph nodes must process enormous numbers of pathogens; enlarged nodes can be the result. As noted above, several organs are also part of the lymphatic system: the spleen, thymus, tonsils, and adenoids. (Those of us who have had our tonsils and/or adenoids removed due to repeated infection are now minus part of our lymphatic system, a system that helps to fight infection — one of the ironies of life.) So it’s easy to see why a vigorous lymphatic system is important to our health. Lymph moves slowly. It has nothing to pump it, instead being moved by our breathing and by the movement of the skeletal muscles. A sedentary way of life leads to a stagnant lymphatic system; illness or surgery can have the same result. By the same token, a stagnant lymphatic system predisposes us to illness. The word lymph comes from the Latin word lympha, which means “spring water.” We need that clear, clean spring water to flow as it should in order to have optimal immunity. 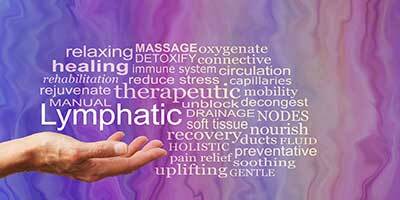 Sometimes, the lymphatic system needs a little help in order to do its job effectively. That’s where Biodynamic Lymphatic Drainage comes in. All forms of manual lymphatic drainage seek to help decongest lymph nodes and move lymph through the vessels. What distinguishes Biodynamic Lymphatic Drainage (BLD) is that the BLD practitioner seeks to follow the path of the lymphatic fluid at the slow pace of the fluid itself. Using palpatory skills honed through many hours of training and practice, BLD practitioners can feel the flow of the lymph through the vessels and detect when that flow has been compromised. After clearing the nearby lymph nodes, we move our fingers over the skin in the direction of the lymphatic flow, at the lymph’s own pace. Biodynamic Lymphatic Drainage is gentle and noninvasive. 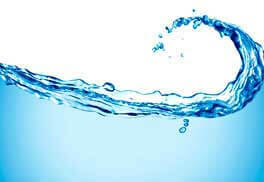 The slow pace and light contact often prompt clients to relax deeply and even doze off during treatment.